Time for another classic brochure from my personal collection. 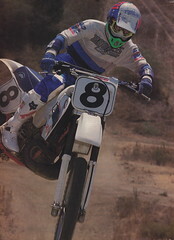 This one covers Kawasaki’s 1996 off-road enduro lineup. In 1996, that consisted of three full-size machines, the KDX200, FLX250R and KLX650R. In 1996, the KDX200 was the sole survivor of a class that once consisted of Suzuki, Yamaha and Honda offerings. Once hotly contested, the 200 class had dwindled to only two competitors by the late eighties. At the start of the decade, both the Suzuki PE and Yamaha IT had given the KDX quite a run for its money, but by the time the nineties rolled around, they were both a memory. In the case of the XR200R, Honda had gone its own way by trying to make their small-bore four-stroke competitive with the lighter and more powerful two-strokes in the class. Mid-eighties dalliances with four-valve heads and dual carbs made the little thumper slightly faster, but exponentially more temperamental. Even with an RFVC head and enduro hardware, the XR proved far better at playing than racing and by 1990, Honda had embraced this fact by ditching the fancy motor, chopping the suspension, removing the lights and pitching the XR as more of a beginner bike than a woods weapon. This left the indomitable KDX as the last of the Japanese 200 class enduro machines. In spite of its class dominance, the KDX had continued to receive regular updates, including a 1995 complete redesign. The new ’95 machine ditched the inverted forks of the ’93-’94 KDX and went back to a set of plush 43mm conventional cartridge units. A new frame also adopted a KX-style perimeter frame for superior handling. The motor remained a KIPS-equipped two-stroke single that pumped out tons of torque and a butter-smooth delivery. While not particularly fast, the KDX200 was nearly indestructible and capable of powering through any terrain short of a massive hill-climb. Even better, with some sensible mods, it was capable of being a pretty serious lightweight woods racer. For 1996, the KDX200 remained unchanged, aside from a very purple coat of paint on everything. On the thumper side of things, Kawasaki offered two valve-and-cam enduro racers in 1996, the mid-sized KLX250R and big-bore KLX650R. Originally introduced in 1994, the KLR250R offered an advanced DOHC valve-train, liquid cooling and a KX-like chassis. Further upgrades included a set of 43mm inverted Kayaba cartridge forks and dual-disc binders. While not fast by modern 250 four-stroke standards, the KLX was quite a performer in its time. It easily outclassed Honda’s aging XR250R and prompted several thumper fans to try and mod it into a motocross racer. While no world beater, the mid-size KLX would remain in Kawasaki’s lineup for several more years after getting a displacement bump to 292cc in 1997. The last of Kawasaki’s Enduro offerings for 1996 was the mighty (big) KLX650R. Initially introduced in 1993, the 650R was designed as a direct competitor to Honda’s Baja-conquering XR600R. On paper at least, the KLX looked like it should make quick work of the aging XR, with its advanced liquid-cooled motor and state-of-the-art chassis. In the real world, however, the green machine never lived up to its spec sheet. Overweight, top-heavy, and prone to chronic over-heating, the 650R proved no match for the older, but better engineered XR.